It’s cherry blossom time in Washington, D.C., and many visitors will descend upon the city to see the famed annual unfolding of pink and white petals. I live in nearby Annapolis, and though it’s my first year here, I know that the prolific opening of these blooms means that all of us can rejoice. Springtime has arrived. The glory just outside my writing room window brings to mind one of my favorite poems. It is modeled on the Japanese form of haiku, which generally has only three lines, the alternating syllables short in number: five, seven, five. The form also requires that the verse be contemplative in nature. 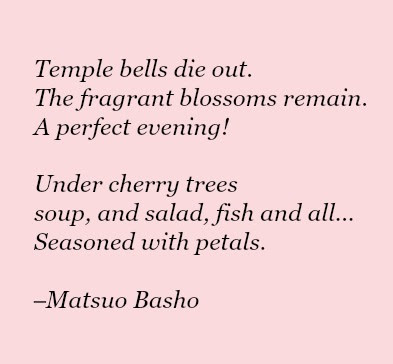 This one is by Basho, a famous 17th century poet, and emphasizes that to stay “in the moment” is magical because it makes us remember that our seasons always pass and then return. As we leave behind the months of blizzards that plagued many of us this winter, we see the flowering of spring and can take encouragement once again in life’s cycle. I hope you enjoy the poem as much as I do. Celebrate the regeneration of earth–be it with snowdrops, daffodils, or cherry trees.